I have a lot of clothes that I don’t wear because it was pushed to the back of my closet or I could never find anything to go with it. 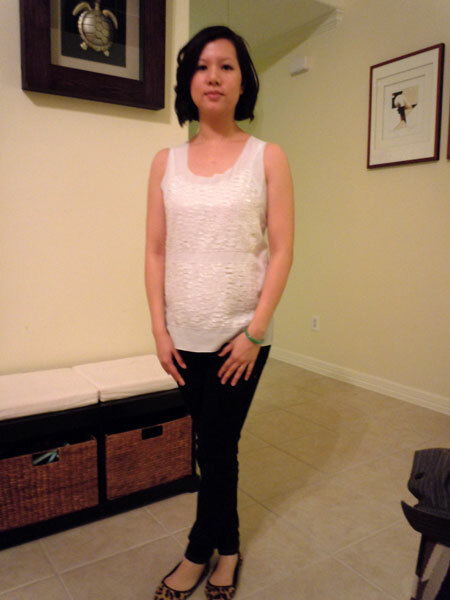 While organizing my closet I found this lovely Ann Taylor Loft Shell from its Spring 2011 collection. It has been breezy, a bit chilly lately in Houston, TX, but the day I found this shell, Houston was having a somewhat humid 75 degree weather. I thought that it was a sign that I needed to see what I can wear with this top. Very comfortable outfit. I could totally see myself in this outfit when I’m shopping, or picking up the kids from school. 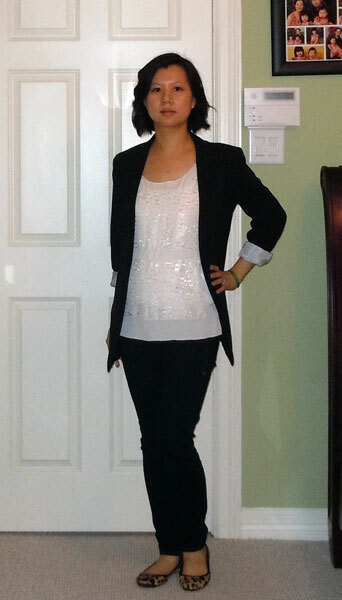 I did notice that the shell looks boxy on me, so I decided to add a boyfriend blazer for work. I wore this outfit to work with the blazer. The blazer is a bit large on me. I bought this blazer as I was losing the baby weight. It fit then but I lost about another 5 lbs since then. So when I button the blazer, it’s loose around the waist. I probably have to get this blazer altered so it’ll be more fitted. After work, our family planned to go out to eat. A blazer is too business like so I pulled a cardigan for our family night out. By evening, the weather became cooler around mid 60s. 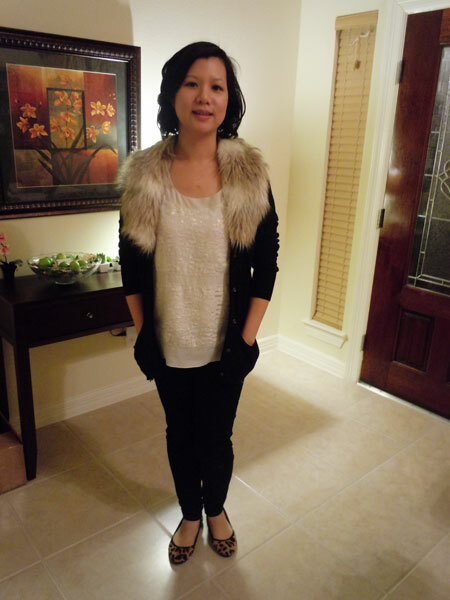 The fur collar totally kept me warm around my neck area. The shell isn’t cut too low but around this of the season I tend to get sick so easy that I just want to keep myself covered up. This last outfit was inspired by Lauren Conrad and Fash Boulevard. Her Lauren Conrad outfit was super cute that it made me think how I can work with my Lauren Conrad Pleated Chiffon Skirt that I just got at Kohls.com. It’s a basic outfit that can be turned into a work appropriate outfit with a blazer or wear it with a cardigan for a causal look. Up the flirty, romantic factor by switching jeans for a trendy skirt. I’m very happy with the looks. 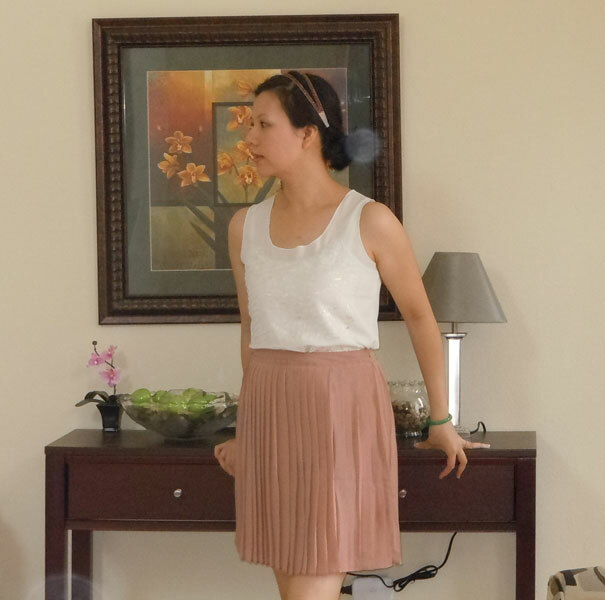 I normally don’t wear skirts because I am not comfortable running after my kids in a skirt. But after seeing myself in this really romantic outfit, I think I’ll incorporate more of it in my daily wardrobe choices. Is there a piece of clothing that you plan on rockin’?